Fresh Light on a Sunday School Classic? Pangs of Northerness @ 25¢ a Stab? Here's Sunday's sermon, the third message in our four part series on Jesus' childhood. I took the day off Tuesday: played squash with a good friend, ate a peaceful plate of pad Thai in the mall food-court, took a nap, spent some time with my wife, spent the evening blogging, with the kids building Lego at the table. It was very restful, rejuvenating, re-energizing. But not, I think, Sabbath. When I started pastoring, my church board very wisely asked me to set aside a day for rest in lieu of Sunday. I heard a report recently that on average pastors are spending about 55 hours a week at work, and 42% work 60 or more hours a week (LifeWay Research). And in ministry roles in the past, I've stood pretty close to the edge of that deep abyss called burn-out and looked down. The vertigo alone was enough to teach me to appreciate the wisdom of taking a day to rest. So a day like Tuesday was wise, necessary, healthy and really, a gracious gift from God. But I hesitate to talk about it, necessary as it was, in terms of Sabbath. I was recently at a pastor’s conference where the speaker told us, in no uncertain or gentle terms, that not to take a day off for Sabbath was to be in "dereliction of duty." And it's that sentiment-- Sabbath is a duty we daren't ignore-- that makes me hesitate to talk about my time off Tuesday as a Sabbath day. That, and the fact that when we interpret the Biblical idea of Sabbath in terms of simply taking a day off so that we can work harder, better, stronger on the six we have left, a number of ungracious things start to happen. First, we actually, inadvertently put the focus on the 6 days of work rather than the 1 day of rest, since implicit in the idea of "re-charging" is the idea that the charge is necessary so that we can spend it on the work alone. Then there's the problem of picking and choosing. What is it about the Sabbath day in particular that must be carried over from the Law, when things like making a woman drink bitter water to test her marital fidelity can be discretely swept under the Tabernacle's welcome mat? And what is it about the Sabbath day that must be carried over when the actual rules about the Sabbath can be discretely ignored (e.g. we don't execute Sabbath breakers like the Law says we must); and what is it about the Sabbath Day that can be carried over when the Law's directives about Sabbath years, and the Sabbath Sabbath (i.e. the Jubilee Year) can be left discretely on the shelf of OT esoteria? (I have yet to leave a field fallow or return any property to its former owner). 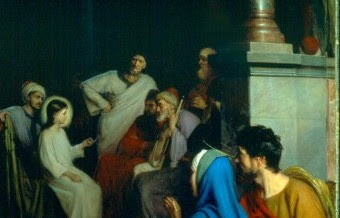 My point here is that the Sabbath day is just one part of a bigger, gracious picture of Shalom for the whole Creation, a reality that the Old Testament is trying to speak into existence through the Law, and that the New Testament is pretty insistent has drawn near, already and not yet, in the person and work of Jesus Christ. So to talk about my day off in terms of keeping my Sabbath-duty before God seems to trivalize the grand, gracious drama of what Sabbath was supposed to be: the metronome whereby we find ourselves keeping time with the rhythms of creation as the mysterious symphony pulses towards its climax in Christ. So it was wise to take some time off Tuesday. But it wasn't my Sabbath. Or, since the Scriptures say unapologetically that this symphony's climax is played in the key of Christ, better to say: Tuesday was no more a Sabbath than Monday, when I worked on next week's sermon, had a mentorship meeting, met with one of our ministry leaders, composed some ministry emails, met with the vice-chair of our church board and finally dragged myself to bed around 11:00 at night. Because my faith in Christ is my Sabbath rest. Paul puts this well. In Romans 14:5, while he's talking to a group of Jewish and Gentile Christians trying to figure out how to do life together, he says: "One man considers one day more sacred than another; another man considers every day alike." At least, that's what the NIV says he said. But this has always left me with the impression that our two options are: to keep one day as a day of rest, or keep them all "alike" and work straight through. There I go putting the emphasis on the 6 days of work, again; and there I go missing the grander drama again. Because it's not exactly what Paul says. Exactly, he says something like: one man "judges" [as sacred? ; lit. krino] one day, the other "judges" [as sacred? ; lit. krino] them all. Romans 14:5 seems to be saying: either we still keep one day as Sabbath (out of genuine appreciation for the deep-down beauty of the Law and the high-up wisdom of the God who gave it), or we keep them all as Sabbath. Since the Shalom which the Law's Sabbath rhythms were speaking about has now drawn near to us in Jesus, since the life-in-tune-with-the-Creator-and-in-step-with-his-plan-for-his-Creation that the Sabbath rules were asking us to live is now lived through faith in Jesus, since the people that the Law was trying to create-- a people who show the world how wise and gracious their god really is-- are now being created in and through and around Jesus, since all this, the meaning of Sabbath has now spilled out into all of life. One or all. Those are the options Paul offers us. And because Jesus is slowly showing me that my whole life has to be covered over and caught up by his good will for his world; and because he's slowly teaching me that I can be in rhythm with his plan for the creation only when I continually keep time with him, and because I really believe him when he said things like "The Son of Man is Lord of the Sabbath," and "man was not made for the Sabbath but the Sabbath for man," I'd gladly choose the "all" over the "one." Around this time last year I spent some time reviewing the most interesting, engaging or challenging reads of 2008. What with moving to a new province, starting a new ministry role, uprooting, re-rooting, transplanting and all, there weren't nearly as many titles to choose from this year as last, but I thought I'd spend some time looking back over the best reads of 2009. 10. Straight Talk, Daniel Wackman et. al. Though I tend to be sceptical of books that claim the power to revolutionize relationships through simple steps, this guide to assertive communication is actually quite helpful. Concepts like "understanding control talk," "using the awareness wheel," "making I statements," and "using active listening," are poignant and effective, and when I take the time to actually employ them in my communication, I often find myself speaking the truth in love. The first time I read Paradise Lost it was as a high school AP English student; the second as a University English Major; the third as a student in a Milton seminar; the fourth as a High School English teacher; the fifth this year as a student of theology. It's interesting to see how my experience of the poem has evolved over the years: from confusion to admiration to love to frustration. I still think it's a master-piece of English literature, but somehow it left me spiritually hollow this fifth time around. When I realized I was going to be a Methodist pastor, I figured I should start exploring the story of the movement's founder. What I liked about Tomkin's biography of Wesley is that he avoids empty hagiography like the plague. The sometimes overly-honest portrait he paints of Wesley is very human and dynamic and complex, though sometimes I felt like he might have given Wesley the benefit of the doubt a bit more often. My second step in exploring Wesley's story. Where #8 avoided hagiography, this book revelled in it, though self-consciously so. At the same time, though, it does provide a helpful overview of the major tenets of Wesleyan soteriology, and challenges us to reflect on how his theology of Grace still speaks to the deepest needs of the human heart. This was a edifying collection of meditations on Christian Spirituality. 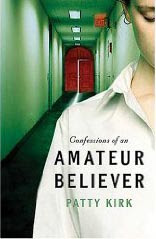 To be honest, I found Patty Kirk less "confessional" and less "amateur" in her belief than the title led me to expect, but as an English Professor, her style is thoughtful and lyrical and really illuminated that old Shakespearean proverb, "it is not enough to speak but to speak true." She takes good writing spiritually, and in that, at least, she's a believer after my own heart. Another read to help me explore the burgeoning Wesleyan in me, this theological/philosophical defence of a "Trinitarian Warfare Theodicy" was often compelling and always engaging. Though I found much of his work helpful, by the end I was left wondering if he hadn't proved too much, and attributed more risk to God than the scriptures ever dare to do. Fred Craddock, the well-known teacher of preachers once said that the best thing preachers can do to develop their skills and hone their craft (outside of the obvious theological, spiritual and exegetical disciplines) is to read a lot, especially fiction, particularly short stories. If this is true, I'd suggest O'Conner as a good starting place, and if it's not, I'd suggest her anyways. I'm not sure how I missed O'Conner in 5 years studying English Lit. and 7 years teaching it, but I'm glad I finally met her. Some of her stories left my heart gaping wide in their wake. Truly beautiful fiction. I'm surprised to rate this book as high as I have- it's not the kind of book I expected to like. However, Pollan's thesis, that nutritionism is actually a made-up, ideologically-driven science that has done more to confuse us than help us in our food choices, and his other thesis, that the modern food industry is deeply flawed and if it isn't killing us it's certainly wringing the soul out of our diets, seemed to strike chords with me. For a while there my family talked quite a bit about the Michael Pollan diet: "Eat food. Mostly Plants. Not too much." Lots of wisdom there. 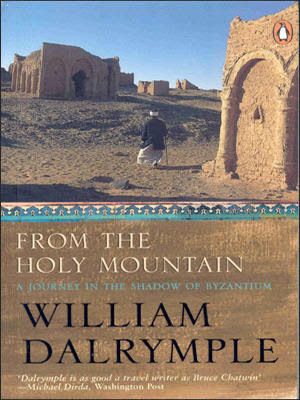 Another unexpected gem of a read, From the Holy Mountain is the travelogue of William Dalrymple, who travels the Holy Land retracing the journey of an ancient Christian monk who wandered the Byzantine Empire back in the 7th Century. Beautiful prose, Church history, adventurous travel, politics, wry humour, art, hermits, monks (modern and ancient), sylites; this book had it all. I closed it with a deeper appreciation of the history of the Orthodox Church, the plight of Christians in the Muslim world, and the convoluted politics of the Middle East. Every once in a while you read a book that takes a bunch of threads already waving about loose in your mind and weaves them together into the tapestry you always knew they could form, but just didn't know how to do it. That's what this book was like for me as it invited me to think through the meaning of the cross all over again. Boersma develops the ancient idea of hospitality as a framework for discussing the Atonement, and then fleshes out the Pauline concept of the recapitulation as the dominant Atonement motif , drawing on Irenaeus and N. T. Wright for theological resources. He shows how each of the traditional models of the Atonement can be read as sub-themes of this over-arching motif. It was like one long "Ah-ha" moment to read. I was putting together my notes for Sunday morning and, wanting to say something more than the typical "bless the gift and the giver" prayer for the offering, I started writing out some thoughts. As I wrote, it struck me how radical an act of worship the offering is, and how lightly we take this theologically weighted moment in the Sunday morning service, and how so often the spirit with which we give says much about what kind of god we think we're giving to. God: You're Lord of all creation (of water, earth and sky). It’s not like you need anything from us. And everything we have is actually yours anyways: it came from you and it’ll go back to you; we’re only holding it in trust. Because in Jesus we’ve discovered that the stingy god, the hard-up god, the needy god, the vending-machine god—that’s not you. That’s an idol. And if we give right now with any of those pictures of you in our hearts, we’d be worshiping an idol. Instead, can you help us to see you as you really are? The God Jesus showed us and taught us to worship: the Father of lights, the generous giver of every good and perfect gift, who gives graciously and wisely to those who ask for His will to be done. And then, can you help us to see this moment of giving now as the rich gift from you that it actually is: a generous invitation to join with you, through our giving, in what you’re up to in the world, a rich moment to be delivered from our petty visions of you, and a chance to be caught up in your purposes for us. For Jesus’ sake make us into the cheerful, adventurous, Spirit-filled givers that he taught us to be and that you delight in. Because it’s in his name we pray. Here's last Sunday's sermon, the second sermon in our series on the childhood of Jesus. I almost didn't post it. 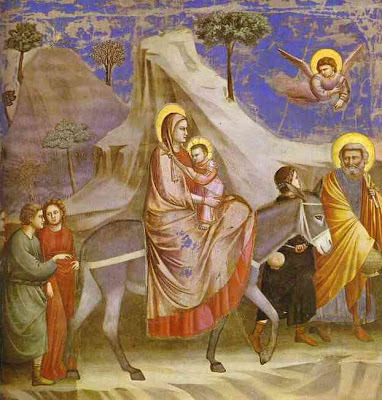 Being the first Sunday after Epiphany (where the church traditionally remembers the Visit of the Magi), this story of Joseph and Mary's flight to Egypt seemed a natural text to turn to, but it turned out to be much more difficult-- more pastorally and thematically and exegetically demanding--than I ever imagined. On the one hand, I don't think we can really get what's going on in this story unless we listen intently for the parallels between Jesus and Israel here, parallels that seem so natural to Matthew, yet seem so counter-intuitive to our modern, linear way of reading. And then there's the dark reality of what's actually happening in this text, a reality that, if we honestly upheld the Word's authority over our hearts, should cut us to the quick. I wrote this song about six years ago now, in response to the meeting with the "modern day Simeon" I described in last Sunday's sermon. Listening to it today, I'm sure I'd nuance some of the sentiments differently if I were to write it again. The hyperbole of the opening verse seems a little too grandiose to me today, and lines like "I will worship with abandon" sound as though "he doth protest too much..." But I still stand by my work. It's a wise man who can grow spiritually without denying where he's been. I offer it here as a follow-up to last Sunday. Just in case my last post didn't fully validate my parking ticket for the nerd-ville parkade, I thought I'd add this list. All that talk about fantasy adventure role playing games got me reminiscing more generally about the video games I played as a kid, games where I felt most sharply the pangs of sehnsucht that I was talking about before. So: here are the top five fantasy role playing games from my childhood. Anyone remember any of these gems from the 80s? Pretty simple: wander the maze, collect weapons, spells and armor; battle magical creatures and what not as you work your way deeper into the dungeon, looking for the Minotaur and the treasure he guards. This was by far the best game at our small town arcade, and the mob of kids crowding around just to watch the fortunate four who got there first after school was always so thick that you were lucky just to see, let alone to ever play. WhenI try, I can still hear the unmistakable voice of the Gauntlet narrator: "Elf needs food, badly!" 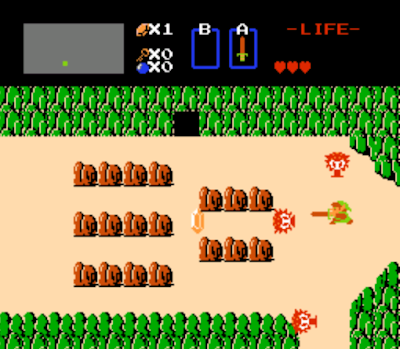 The original Zelda game. Apparently Zelda's a multi-million dollar video game saga these days, but there was something about the Northernness of the original that still has a vivid place in my imagination; and to this day I still remember how to defeat Ganon (lets just say you need a silver arrow). Designed by former animators from Disney, this Mother of all Fantasy Arcade Games used groundbreaking laser disc technology to create graphics the likes of which had never before been seen in a video game. 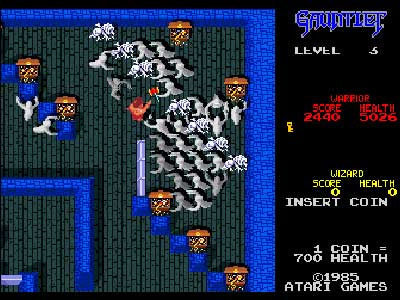 The truth is, I never worked up the courage to actually play this game in the arcade, but I would watch, absolutely mesmerized, while others tried vainly to reach the Dragon's Lair. Sometimes you'd hear rumors floating around that someone knew someone who was watching when some guy actually finished the game and saved Princess Daphne. But I never saw the final scenes of the game myself.. They lived only as lost archetypes in the haze of my imagination. Well, thanks for joining me on this little stroll down amnesia lane. We now return to terra incognita's regular scheduled programming. A few posts ago, I shared a bit about my secret life as a computer game writer back in the Co Co 3 days. What I didn't say there was that, at 14, my game genre of choice by far was the fantasy adventure role playing game. Call me quixotic, but I loved programming magical quests set in magical kingdoms, games in the fullest D&D tradition I could accomplish, with only 128k at my disposal. Now it wasn't the gaming itself that especially appealed to me, it was more the act of world-creation. Programming offered me the opportunity to create worlds where the diabolical machinations of necromancers could be defeated with weapons of light-- worlds where phrases like "you have discovered the Amulet of Imnodel (or some such)" were weighted with wonder-- worlds where words like "vorpal," and "arcane," and "adamantine" and "valiant" rang true, like steel from a scabbard. And because they were games-- your games--you could not only create these worlds, you could inhabit them. As I mentioned before, for old time's sake I've been working on a game using my son's game maker software, and, as those who knew me in those old times might expect, it's a fantasy adventure role-playing game set in a world where you can use expressions like "You have discovered the Vorpal Sword!" with perfect nonchalance. I call it "The Adventures of Elroy." Call me Tolkienesque, but it's the story of a lost elven prince, Elroy, who must journey through a magical kingdom overrun with goblins and jubjub birds, to discover the Treasure of Taran and regain his throne. But while you're waiting for it to download (or mustering up the courage...), let me add this: working on the "Adventures of Elroy," I've been wondering what it was about the fantasy game genre that so appealed to me as a kid. I didn't know at 14, but I think I might now. It was the imagination's ache for a kind of other-worldly beauty-- the deep yearning and poignant desire for that elusive something that haunts the shadows of the best myths, and fairy-stories, and romances. The Germans call it sehnsucht-- a joy-ward longing. C. S. Lewis called it "the stab of northernness." In Surprised by Joy he describes quite vividly "the stab, the pang, the inconsolable longing" of an "unsatisfied desire which is itself more desirable than any other desire." It first touched his heart as a child of 5, when he was reading the story of Squirrel Nutkin in the Beatrix Potter books and was smitten by the very Idea of Autumn radiating behind its delicate watercolours. "It sounds fantastic to say that one can be enamoured of a season," he writes, "but that is something like what happened...the experience was one of intense desire." Later, as a boy of ten, the "Stab of Northernness" would pierce his heart again when, flipping through a book of poems by Longfellow, he read these lines: "I heard a voice that cried, Balder the Beautiful is dead, is dead." The ache that those lines awoke in his heart- a desire for some undefined thing, beautiful but ephemeral, other-worldly but more real than real- would haunt his imagination on its long journey through atheism and eventually to God. It was a pang for a kind of spiritual joy or ethereal beauty that he would later come to associate with the "Idea of Northerness" that he found in the Norse myths and the operas of Wagner. This deep yearning for something beautiful, unsatisfiable, Other, would eventually turn Lewis's imagination, and later his mind, and finally his heart to God. In Mere Christianity, he puts it like this: "If I find in myself a desire which no experience in this world can satisfy, the most probable explanation is that I was made for another world." This is the restless imagination's longing for that other world. The Stab of Northernness. Lewis found it in Wagner. John Keats found it in King Lear. Tolkien found it in Middle Earth (I've heard some say that the opening chapter of The Hobbit is sharp with Northernness, with it's thirteen dwarves arriving unexpectedly on the doorstep of a simple hobbit, to whisk him off in search of long forgotten gold). 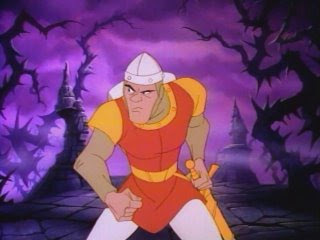 As a boy, I found it, among other places, in the worlds of fantasy adventure video games, which invited me to explore realms where words like "valiant" rang somehow true. I started blogging almost exactly a year ago (though my first post wasn't officially until January 27th, I spent the month of January itself researching, planning and laying-out my blog). I didn't have a terribly clear long-range plan for this blog; though at the time, I didn't have a terribly clear long-range plan for my life. This time last year I was nearing the end of five years studying at Seminary, preparing for God-knew what ministry in God-knew where. I was just looking for a place to keep doing what I'd been doing for the last 5 years at school: thinking and writing and reflecting on things Christian. I've found that place here, and I've enjoyed the challenge and sharpening that blogging has given me over the year. Longest post: a tie between A Valedictory Address and Learning Wisdom in the Writing, both at 894 words. Most fun post to write: The Geometry of Heaven? Worst post: The Leveling of St.Paul. Not really sure what I was trying to say there. For those of you have have joined me on this journey over the last year, thanks for the company and encouragement. For those of you who have stopped in now and then to explore some unknown land with me, welcome and blessings.